As India readies to sign the free trade agreement on services and investment with the Association of Southeast Asian Nations (Asean), taking bilateral trade relations to the next level of a comprehensive economic partnership agreement, the focus is on the laying out of a massive road connectivity plan to tie the region together to boost economic objectives. To start with, India has proposed extending the trilateral highway project connecting India, Myanmar and Thailand to neighbouring Cambodia and Vietnam. The idea is to set up special economic zones along this highway and provide seamless connectivity through these countries by 2016, by when the projects are expected to become operational. Right now, work is on to repair and strengthen 71 bridges that link this stretch. To ensure greater success of this highway project, Prime Minister Manmohan Singh proposed an Asean-India Transit Transport Agreement (AITTA) at the India-Asean Summit in Brunei Darussalam last month. Once the agreement comes into force -likely by 2015- vehicles from association countries will be able to cross international borders without much documentation. 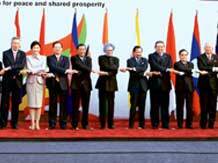 Total bilateral trade between Asean and India reached $75.6 billion in 2012, surpassing the target of $70 billion. Now, with the implementation of the India-Asean comprehensive economic partnership, the target for two-way trade has been set at $100 billion by 2015, for which an integrated transport network would be the key. At present, the market is fragmented and the patchy road network is a stumbling block for free flow of goods and services. This, along with administrative and technical barriers, increases costs and leads to transportation delays, says a study by New Delhi-based think tank Research and Information System for Developing Countries on Asean-India connectivity. While road links are being developed, the proposed AITTA will make crossing the border easier. "AITTA will allow vehicles to move seamlessly across international borders or regional and international trade transportation purposes. AITTA should be in position before the trilateral highway is operationalised in 2016. Potentially, it can be a game changer which will allow us to reap the full benefit of India-Asean free trade agreement, regional comprehensive economic partnership and enhanced connectivity," says Ashok Kantha, secretary (East), ministry of external affairs. The master plan on Asean road connectivity was adopted at the India-Asean Summit in 2010. The benefits from the highways, which are scheduled to be completed by 2016, are manifold. They would improve connectivity, bring India closer to Asean, reduce trade costs, help exploit the country's comparative advantage in certain products, expand markets, as well as reduce poverty and improve the quality of life for the people in the region. A smooth road network would also provide substantial benefits to other countries, particularly to landlocked and island nations by giving them low-cost access to a wider market outside, the report said. India already has a goods agreement in place. It came into force in August 2011 and provides tariff-free access to a range of products, including textiles, pharmaceuticals, chemicals, engineering goods, processed food and auto parts. The likely addition of services and investments to this list of free-trade items in the not too distant future would open up new opportunities for Indian IT and healthcare professionals, designers and researchers. In addition, India is also contemplating expansion of rail network into Myanmar. The rail head terminates at Jiribam in Manipur. A project to connect Jiribam to the capital Imphal is under way and is slated to be completed by 2017, while proposals on connecting Moreh (Imphal) to Tamu-Kalay (Myanmar) is being considered by the external affairs ministry. At the same time, work is also on for developing soft infrastructure such as trade facilitation centres and telecommunication, necessary for any economy to function and thrive. Boosting maritime connectivity is on the agenda as well. India has proposed the establishment of a Maritime Transport Working Group between India, Myanmar, Thailand, Cambodia and Vietnam to examine the feasibility of shorter shipping routes. This idea was initially mooted by Thailand which wants a more direct sea transport route to India via the Dawei port in Myanmar, which is a deep sea port. Right now ships have to be routed via Singapore to reach India. "It is important that we identify economic activities that can be pegged to these corridors, which could attract private sectors from both Asean and India, including from India's Northeast," says a foreign ministry official. Another project that India has shown interest in is the Mekong-India Economic Corridor (an offshoot of the trilateral highway) to link Myanmar, Thailand, Cambodia and Vietnam with India. The corridor- which might be funded by Asian Development Bank -will extend from Ho Chi Minh City in Vietnam to Dawei in Myanmar via Bangkok (Thailand) and Phnom Penh (Cambodia) and then on to Chennai in India.